Our customer service team offers you a comprehensive range of services — from maintenance and repairs through to annual calibration work and training sessions. Service is our top priority. Our customer service team is on hand to provide assistance to you in using your measuring equipment for traffic monitoring. We offer a broad range of services: For example, our technicians can maintain and repair your equipment to ensure fault-free operation. During our training sessions we can show your personnel the best way to operate our systems — and record measurements that will stand up in court. We can also assist you with the compulsory annual calibration of your equipment. We also liaise with your local testing and certification authority and help with official measurement and acceptance. Our customer service team guarantees that your measuring equipment will provide a long service life and precise results at all times. 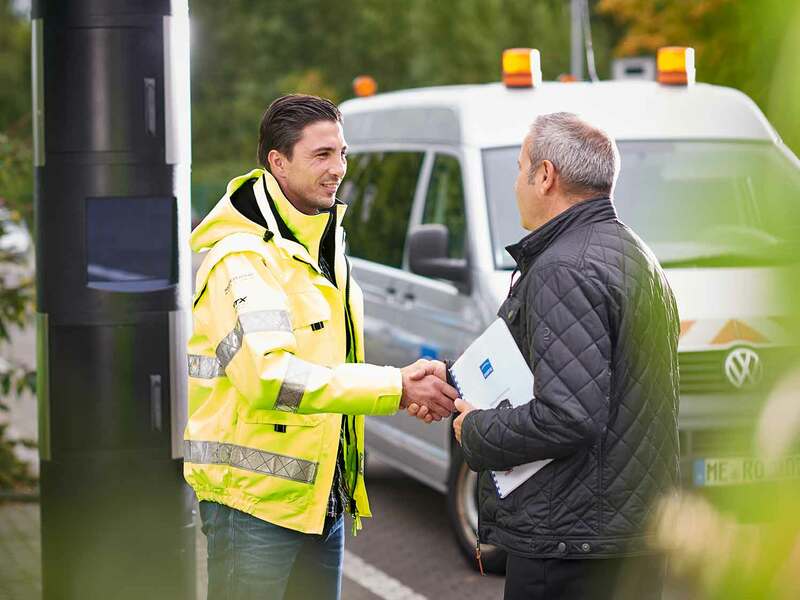 Our technicians can visit you on site to maintain and repair your traffic safety systems. Our technicians support you to calibrate your measuring equipment to ensure smooth and accurate traffic monitoring. Our training sessions teach police and other authorities how to correctly setup and operate our measuring equipment. You can access our traffic safety customer service team quickly and reliably 24/7 via our online platform. Remote maintenance of your traffic monitoring systems via a secure Internet connection. myTraffiStar provides an accurate overview of the statistical traffic data from your measuring systems.